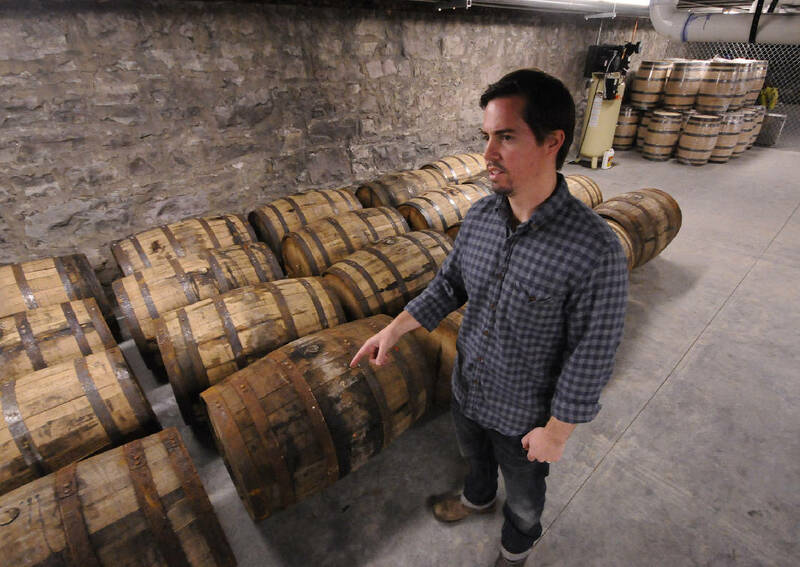 Tim Piersant, owner and co-founder of Tennessee Stillhouse, stands with full barrels of 1816 Chattanooga Whiskey at the company's location on Market Street. Years of searching for a home took Tennessee Stillhouse -- the company responsible for Chattanooga Whiskey -- through a series of ups and downs, including the loss of a co-founder. But at long last, the company is set to open its distillery, tasting room and retail shop on Market Street. Immediately across from the Chattanooga Choo Choo, Tennessee Stillhouse lives now in a 3,000-square-foot space with original, exposed brick walls and decor made from aged whiskey barrel staves. The new location will open to the public on Tuesday and will let customers see how whiskey is made and taste test new stuff made on the premises. Just inside the front door of the new Stillhouse is the reception area and retail section with shelves lined with Chattanooga Whiskey hats, shirts and many fifths of Chattanooga Whiskey. "We're not a restaurant, and we're not a bar," said Tim Piersant, Tennessee Stillhouse owner, CEO and co-founder, on Friday. "People are going to come here before they eat, and they're going to come here after they eat." Piersant talked Friday about the added value of ongoing Choo Choo renovations that will add a new restaurant and music venue and bring the Comedy Catch downtown, in addition to adding over 90 new apartments, right across the street from the Stillhouse's front door. He said Friday that he's excited to get the new, 100-gallon copper still up and running, making future batches of whiskey that will be ready for sampling soon and for sale by summer. When the new batches are ready, the first Chattanooga-distilled whiskey in a hundred years will hit store shelves. This 100-gallon copper still will be in production daily and be in view of visitors to the new Tennessee Stillhouse location on Market Street. When better weather rolls around, customers will be able to have drinks on an uncovered patio out back of the Stillhouse storefront. Below the tasting room and still is the old building's basement, where barrels of whiskey are stored and the still's control panel are. Piersant says he's happy with the micro-distillery, which is considerably smaller than previous plans presented by the group. "We chose a lot of spots," he said Friday. "It's been a short-long three years." The journey began when Piersant and former partner Joe Ledbetter decided to bring whiskey production back to Chattanooga, an industry that disappeared from the city when Prohibition went into effect. In 2013, the co-founders finally overturned state and local laws barring Chattanooga whiskey production. Chattanooga Whiskey Co. was formed and began labeling 1816 Whiskey. The bill, which passed the state Legislature, hangs on the tasting room wall. It was April 23, 2013, Piersant recalls. "We would not be here without it," he said. It wasn't an easy road, with Stillhouse whiffing on a couple of prospective properties for one reason or another and Chattanooga Whiskey Co. co-founder Joe Ledbetter leaving the company. "There were moments along the way when I questioned whether the challenge was going to overcome me," said Piersant. "Ask anyone who has started a business if it was easy." But Stillhouse landed a major asset late last year when Grant McCracken, a brewer at The Boston Beer Co. (famous for Sam Adams), agreed to come onboard as head distiller. "It was actually, I think, a pretty easy decision after we made our first visit in August," said McCracken. McCracken decided to learn distilling himself and wanted to get in on the ground level of an up-and-coming distillery. Mutual acquaintances introduced Piersant and McCracken. "It was serendipitous, really," said McCracken. Stillhouse leaders are still trying to decide how to work out pricing and payment for tours and tastings but feel confident that when Tuesday rolls around, things will fall in line. Right now, the plan is to charge between $8 and $12 for a tour and tasting package. Hours will be noon to 8 p.m. on Mondays, Tuesdays and Wednesdays; 10 a.m. to 10 p.m. on Thursdays, Fridays and Saturdays; and noon to 7 p.m. on Sundays.